July 22 is the historical feast day of Mary Magdalene, so it’s very fitting to share this updated post from the early days of Sophia’s Children. Not that we need confine such celebrations and honorings to one day. After all, Wisdom is timeless, yes? Who was Mary Magdalene, really? And why is this question important at all given that we’re talking about a woman who lived 2,000 years ago, and about whom we have only slender references? For quite a few years now, Mary Magdalene has been re-emerging strongly (along with Lilith and other feisty Divine Feminine exiles), and that’s usually a clue to pay attention to what’s arising since Life restores bits of Wisdom when the timing is vital to Life. Mary Magdalene, or perhaps Mariamene Mara, resurfaces in our collective consciousness as part of a general reclamation of the Feminine to the Sacred Marriage altar. Most of us grew up with the notion that Mary Magdalene was a repenting prostitute, if we heard of her at all. More recently, we’ve learned that she was a very close companion of Jesus, one of his devoted disciples, ‘the apostle of apostles’, according to gospel references. The Penitent Mary Magdalene, c. 1598 by Domenico Tintoretto. Public domain image courtesy of Wikimedia. The bible doesn’t actually say that Mary Magdalene was a prostitute. So what, or whom, do we have to thank for that rather malicious defilement of the Apostle to the Apostles, Mary Magdalene’s, character and role? A sixth century sermon by Pope Gregory ‘the Great’ (obviously not Pope Gregory the Accurate!) is often credited with perpetuating, if not starting, the ‘Magdalene’s the reformed prostitute’ rumor, though some distinguished scholars, such as Dr. James Tabor, point to earlier efforts to diminish and discredit her. The book and subsequent film, The DaVinci Code, brought Mary Magdalene into even greater popular visibility, raising the possibility and stimulating debate about whether she was the wife as well as disciple of Jesus. While this might be an interesting conversation, to me it seems a distraction from the more important question, and greater likelihood, that Mary Magdalene was a spiritual adept, early church leader, and teacher in her own right. Once-hidden and now discovered sacred texts and ‘lost gospels’, along with other emerging work, seem to suggest this. 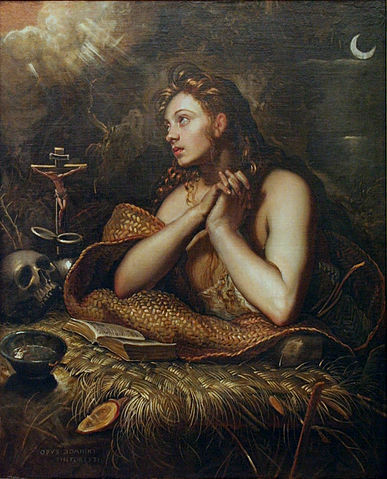 Mary Magdalene, by Richard Stodart. Find a link to Mr. Stodart’s Mary Magdalene page below. Wisdom, Sophia, incarnate, in other words. Mary Magdalene is also portrayed and seen, in the various gospels, as one who ‘gets it’ — one who has truly understood and experienced the teachings of the wisdom master, the rabbi Jesus. The scholar John Lamb Lash has explored this indepth in his writings on why Mary Magdalene matters in the resurgence of the Feminine. 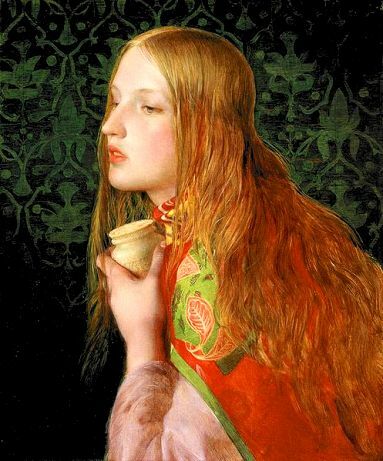 Yet Mary Magdalene, according to the gospels and more recent scholarly writings about her, was one who, in addition to an emphasis on the inner Mysteries, engaged in the world. She is portrayed as a teacher and adept, yes, and also as one who is devoted in action — it is she, with two other women, for example, who don’t flee the threats at the crucifixion. They remain there, present, witnessing, and perhaps ‘holding the space’ through their attention and devotion. It is Magdalene who goes to the tomb with the sacred oils, and it is to her that the risen Jesus first appears and gives the instruction to ‘go tell the others what you have seen’. Because Mary Magdalene is one who has seen. In these reflections we begin to see why the question of who Mary Magdalene really seems to have been is important — why these ways and qualities are so needed in our lives and in our world now. We see how the path of inner transformation and devotion to wisdom enlivens these beautiful qualities of sensuality, devotion, intimacy, dignity, wisdom, and deep respect and reverence for all as Divine expressions of sacredness. Who was Mary Magdalene, and what does she offer us now? Mary Magdalene’s re-emergence is important for us now for a variety of reasons, including the fact that sexism, smear campaigns, silencing, and other micro- and macro-aggressions are still prevalent in our culture, workplaces, religious and spiritual communities, and homes. The explorations and deep remembering continue. Seek for her in your heart; what does she whisper to you? Image Credits and Links: Find Richard Stodart’s Mary Magdalene page here. Sharing this informative and revealing side of Mary Magdeleine. Thank you! I loved reading this interpretation of Mary Magdalene Jamie, thanks for sharing.